The Walking Dead does an excellent job of melding practical and digital effects, you will find yourself attempting to dodge out of the way when a walker bites one of the actors on screen. It's difficult to believe that eight seasons of this show have passed, and in fact, in just a few short weeks, season 9 will begin. When it was first announced that TWD was being picked up by AMC, I was beyond excited. Being a fan of the comic books, as well as Zombie movies/books, in general, I couldn't wait. Like many fans I have spoken with, I feel the show seems to have sputtered and is even wobbling on tenuous legs. As a fan, I want to feel a sense of excitement again, like I felt during the first seasons. Especially since season 8 seemed to drag its plot, like a walker drags its left leg, behind itself, laboriously, limping interminably from one episode to another, bleeding from numerous plot-holes, until the final episode, thankfully arrives… like a bullet to the head. I understand carrying a story arc across multiple seasons can be difficult, but the showrunner (Scott Gimple) needs to attach some jumper cables to the writers' chests and get them fired up again, without the same tired ideas being rehashed, ad nauseam. However, seeing some of the trailers/teasers for season 9, there may be hope yet. But before we get ahead of ourselves, let's discuss this Blu-ray release, to get you prepped for October 7th! Together with the Hilltop and the Kingdom, Rick and the Alexandrians bring "All Out War" to Negan and his forces. The Saviors are larger, better equipped, and ruthless, but Rick and the unified communities are fighting for the promise of a brighter future. The battle lines are drawn as they launch into a kinetic, action-packed offensive. Up until now, survival has been the focus of Rick and our group, but it's not enough. They have to fight to take back their freedom so that they can live. So that they can rebuild. As with any battle, there will be losses. Casualties. But with Rick leading the Alexandrian forces, Maggie leading the Hilltop, and King Ezekiel leading the Kingdom, Negan and the Savior' grip on this world may finally be coming to an end. Like most of my reviews, I'm not going to provide an episode by episode synopsis, you can get that anywhere. However, I will provide some details to help entertain and inform. In this 5-disc set, you will get the complete season 8 as well as commentaries and a few extras. A small booklet was included in mine but it was just a marketing book with swag, for those that need to burn more of your hard-earned dough on Zombie-gear (I reviewed the standard edition, but know that you can get other versions including a lenticular cover from Best-Buy, Wal-Mart, even a Steelbook version from Target). If you are a completest, you will not stop at one version, and keep your eyes open for a Todd McFarlane version as well. The Blu-ray is an MPEG-4 AVC, 1080p with an aspect ratio: 1.78:1. Like previously reviewed Walking Dead seasons, the transfers are fantastic. They spare no expense at ensuring the gore is lurid, and the indoor/night scenes are lit well and have decent clarity. The special effects shine on this show and they do an excellent job of melding practical and digital effects. You will find yourself attempting to dodge out of the way when a walker bites one of the actors, and the Grinder scene in the junkyard is absolutely out of control. I will not forget the audio here either, the Dolby TrueHD 7.1 is excellent. Gunfire, explosions, screams of the living, the dead and the dying are vibrant and really connect the audience with the action. If you have a great surround sound system, hold tight, you're in for one Hell of a ride. What I did find a bit disappointing was this season's Special Features section, which was a tad anemic. You will get the well-deserved farewell to Car Grimes: Leaving a Legacy, as well as, In Memoriam, which bids farewell to a few other players that died this season, and the Price of War, which shows the downward evolution of our hero, Rick Grimes, and the toll the apocalypse has taken on the erstwhile, white knight. 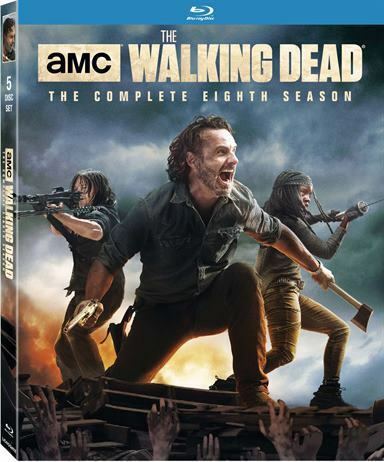 There are also audio commentaries, which can be accessed from the main menu or if you play the individual episodes; Scott Gimple, as well as various writers, provide the usual insights into the making of the show. And that's it, unfortunately. One of my many pet peeves about this show is the lack of connection we have with certain characters until it's time to kill them off. At which point, they slap a few extra scenes with this person, and then they meet their untimely demise. It's not enough time to connect the audience to the character, and so, at best, their deaths go un-mourned, and at worst, we couldn't care less, and their loss rings hollow. I felt this way while watching the ‘In Memoriam' featurette. All in all, this is a decent release, from an otherwise, overlong season. For the completest out there, you need to own this, to nuzzle between season 7 and the upcoming season 9. And for all of the rest of the fans out there, let's keep our fingers crossed that Season 9 comes out swinging. I, for one, want to see one of the most exciting, as well as terrifying, Walking Dead seasons yet! Download The Walking Dead: The Complete Eigth Season from the iTunes Store in Digial HD. For more information about The Walking Dead visit the FlickDirect Movie Database.